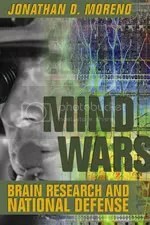 Allison Bush at the Dana Press office in Washington has very kindly sent me review copies of Mind Wars: Brain Research and National Defense, by Jonathan Moreno, and The Dana Guide to Brain Health, by Floyd E. Bloom, M. Flint Beal and David K. Kupfer. Jonathan Moreno is director of the Center for Biomedical Ethics at the University of Virginia. His book, which will be published in the UK on December 11th, looks very interesting, and I’ll be posting a review of it on this blog in the near future.